There’s something special about the experience that you just don’t get by stirring something on the stove top or baking it in the oven. Maybe it’s the act of tending the fire. Or the fresh air. Or the good company of friends and family. Or maybe it’s the smell of the smoke and the sound of the sizzle. Whatever the reason, grilling is one of life’s simple pleasures. And a reliable grill that won’t let you down is key to making the most of the experience. 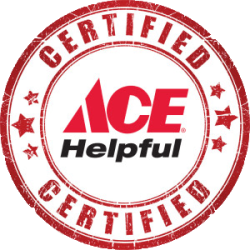 At Toney Ace Hardware we are a full line Weber retailer. We carry grills and colors that you won’t find at the big boys. Try finding any of the Premium Genesis grills at The mass merchants, or how about a Brick Red Platinum or Performer charcoal grill, it just won’t happen. Plus if you really want to know the ins and outs of what makes a Weber a step above the rest, stop in and talk to any of our sales associates. You’ll find a helpful smile and the knowledge that will help you get the grill that’s right for you. What Makes a Weber® a Weber®? More is not always better. Our grills are engineered to be fuel efficient. Burners and valves deliver the precise input of BTUs to reach high searing temperatures—with no inefficiencies, so you won’t waste fuel. When you have a Weber you can have FUN with it!